Once upon a time, we did not allow them in classrooms and other places of formal learning. But that’s an old story now. Comics tell stories that make us laugh, cry, reflect and listen. They have been creating an interactive experience for the reader way before the advent of technology. Think cave art. Comics evoke an emotional response with their art – whether it is a simple line drawing or a detailed flourish of graphics. But aren’t Comics meant for children? Well, Comics do come with certain pre-loaded notions. Perhaps the strongest association of Comics is with superhero stories for children. Superman, Batman, Spiderman and others are legendary. In India, we have consumed Mandrake, Phantom, Tinkle and Bahadur when we were kids. A lot of our mythology is narrated through comics. Such a perception about Comics makes it the perfect non-entrant for serious learning or learning seriously. Well, we say nay to Comics being essentially a children’s medium. Here are some modern-day examples where Comics have been used for serious topics. A great example is the documentation of the 9/11 report. A Comic was the medium of choice to narrate a complicated event, featuring multiple agencies and their actions leading up to the final tragic event. Then there is Persepolis, an autobiography about life in Iran during and after the Islam revolution. At iDesign Skills, we believe that Comics may be allowed to enter the realm of organizational learning. And there could not be a time better than now to make this happen for two reasons. The first reason is because story-telling or learning with stories is here to engage us, the citizens of the attention economy. Comics are a great vehicle for taking stories to learners. The second reason is that our collective ability to understand icons – the basic alphabet of the Comic – is at its peak. And now, pushing us aside, the Comic decides to speak for itself. Here’s a little Comic Caper, starring a Comic (who else?) and an L&D function somewhere in the world. Feature # 1 – Juxtaposition In a Comic, images appear side by side separated by spaces which are called ‘gutters’. These white spaces are the ‘time line’ within which a sequence moves ahead before the next image appears next to it. You may call a film a fast-moving Comic. But here’s the difference. In a Comic different frames appear in different positions on a time line. In a film, different frames appear rapidly in the same position on a time line. The Learning Advantage of Feature # 1 – Juxtaposition At a cognitive level, juxtapositions result in experiences that are different while reading a Comic or watching a film. In eLearning, when you click on the Next button, a new content frame replaces the old frame – exactly like in a film. Research has shown that images that are ‘spatially distributed’ i.e. when they are juxtaposed, result in lesser cognitive load for the learner than when images are ‘spatially stacked’ or placed one on top of another like in a film or in an eLearning program. This is called the ‘split attention effect’. 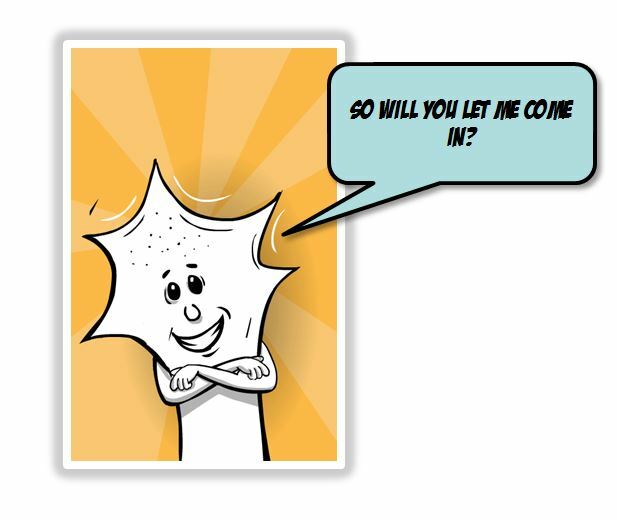 Feature # 2 – Icons In the ‘Comic Caper’ you came across a character that looked like this. It did not need any telling that this character was a Comic. Neither did you question why it looked a certain way and why it was a living creature. It was something you accepted easily as a part of the story. Images like these are popularly called icons. Icons maybe images of a person, place, thing or an idea. Icons are highly simplified representations of everyday objects. A circle with two dots and a line below is immediately recognized as a human face – the ubiquitous smiley. The image below can be identified as that of a man although you may have never really seen a man looking exactly like that. Icons simplify our understanding of any object with least cognitive load. Icons are the language of Comics. Comics can have icons that vary in their degree of detail – from simple outlines to detailed flourish of art. The Learning Advantage of Feature # 2 – Icons Using Comics to narrate stories or represent other types of content gives us the icon advantage. The use of icons makes content highly comprehensible. With the use of icons, content can be made to have universal appeal, and is most suited for both human and non-human representations. Feature # 3 – Emotions Scott McCloud says “The idea that a picture can evoke an emotional or sensual response in the viewer is vital to the art of comics”. Let’s extend the idea of the 2nd feature, icons, to what Scott McCloud says. Just as icons can be used to represent physical objects and the living, they can also allow us to ‘objectify’ emotions – thus allowing us to represent varying degrees of different kinds of emotions – aesthetically. No other form really allows this. You may find this little aside related to Comics interesting. The evolution of comics was greatly influenced by the art movement in the 1920s – where art extended itself as a form of expression of the artist’s inner turmoil. Strong lines, bold colors were used to identify different emotions. We must mention Kandinsky’s work here whose work gave us a new form of symbolism – triangles represent aggression, squares represent balance and circles represent spirituality. The Learning Advantage of Feature # 3 – Emotions When narratives need to focus on affective, emotional content, we cannot imagine a media more suited than Comics. Comics allow representation of strong emotions in an aesthetic manner. This feature is particularly useful in Behavioral Learning or Affective Design. Type of Learning Suited for Comics So if Comics are such a great medium for learning, where can they be used judiciously? We have mastered the art of imparting knowledge and skills. The lack of focus on affective education or attitude development was keeping us one step away from holistic learning. This scenario is undergoing change as L&D functions are waking up to weaving affective development in training programs. 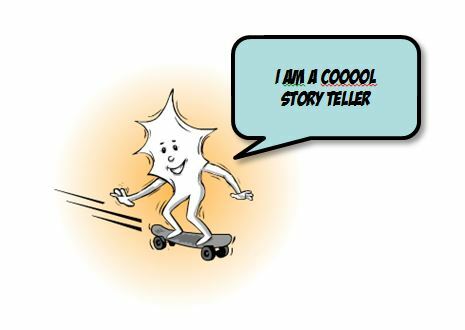 Undoubtedly, the most popular tool for holistic learning – stories – is therefore in great demand. And story-telling cannot get a better vehicle than Comics. A Comic is a great way to narrate stories. For teaching certain types of concepts, especially those which are abstract. Using Comics can give them abstract concepts a ‘face’. The Comic exhorts you to let it in the realm of corporate learning.